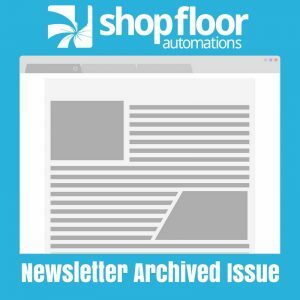 The following is an archived copy of the October 2013 Shop Floor Automations Newsletter. of loading the NC program along with various other files. Loading tool offsets are common on the shop floor but are typically a manual process. as well as the associated tool offsets. to simplify the task and save time. Limited to the CNC controller memory in your machine? streamline the program to fit into the controller. from the PC hard drive to reduce the size of the program on the CNC controller. and Lathes with P300, P200 and P100 CNCs can be captured in real-time. one production management software solution. improve your shop floor with our solutions. website and can include a little background on your company to share. Let us analyze your shop for free and provide you with the best solutions to suit your needs! Windows XP will no longer be supported by Microsoft in April, 2014. Microsoft, you will have to upgrade from Windows XP. Contact us in advance so we can help walk you through this process.